If you're new to running, or new to marathons, you might be intimidated by the distance. Yes, 26.2 miles is a long way, but more people are taking on the challenge each year. 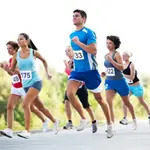 According to Runningusa.org, there has been a one-percent increase in finishers from the same 367 marathons for 2010 and 2011 (495,135 vs. 500,206). Since 2000, there's been a 47-percent increase of U.S. marathon finishers (353,000 vs. 518,000). If you're thinking about doing a marathon, here are six fantastic reasons for you to take the plunge and register for a one. Training for 26.2 miles will help increase your endurance. It will help make your heart stronger, improve circulation, and strengthen your muscles. You will probably also see mental improvements as well, such as feeling less stress, being more upbeat, and experiencing the "runner's high" on a regular basis. Many runners now combine their marathon goal with the goal of helping others by raising money for charity. Use the inspiration and motivation that you're helping others get you through 26.2 miles. Plus, it's difficult to quit when someone else has donated on your behalf. Everyone has at least one fear or insecurity. For many people, running a marathon seems like a huge undertaking, in fact, it might even seem impossible. It's true that running a marathon is a challenge that requires commitment and perseverance. That being said, every time you step outside out of your comfort zone and accomplish something new, you grow stronger and become more confident. The running community is amazingly tight knit, welcoming and diverse. Training for a marathon with friends is always easier and many fellow marathoners welcome newcomers with open arms. Once you make the commitment to the marathon, reach out to your local running club or other runners in your community. The chances are that you will find someone to train with and also make some new and long lasting friends in the process. It's hard not to bond when you run over 20 miles together. There's nothing more rewarding than accomplishing a large goal you set. Running a marathon is one of the largest physical challenges you can set for yourself. Most marathoners equate the day they finished their first marathon with other special day, like their wedding or the birth of their child(ren). It doesn't matter if you finish last. You are still a marathoner and are part of an elite club of people that have completed 26.2 miles. You may not realize how much your life and actions impact others on a daily basis. You may think what you do doesn't make a difference, but that couldn't be further from the truth. If none of the other reasons motivate you, then turn your focus outward. Run a marathon to inspire others to do something they thought was too tough or impossible. When others see you train and cross that finish line, someone will follow your lead and start running. They might even run their own marathon or face a different fear. What other reasons do you have for running a marathon?